This stunning 1 oz PAMP Suisse Year of the Dog Silver Bar is the latest issue in the beloved PAMP Suisse Lunar Silver Bars Series showcasing the superb image of a dog. The renowned PAMP Suisse refinery celebrates the 2018 Year of the Dog by issuing the new edition of its Silver Lunar Bar series featuring the stunning image of a dog - this year’s symbol according to the Chinese Zodiac. Every year, the mint strikes a new Silver Lunar Bar to commemorate the yearly character that usually represents the distinct personalities of the people born in those years. Persons born under the Dog sign are regarded as loyal, friendly, smart, and honest. The other characters of the Chinese Lunar calendar are the Rat, Ox, Rabbit, Tiger, Snake, Dragon, Horse, Sheep, Rooster, Monkey, and Pig. This makes PAMP Suisse Silver Bars an excellent piece for any collector. Along with PAMP’s exceptional craftsmanship, this astounding bar with an eye-catching design is a perfect addition and a treasured keepsake. Every Silver bar comes in a beautiful red assay card verifying a certified assayer has approved the bar. Obverse: Features a loyal and happy Dog. Reverse: Shows the opposing view of the Dog. 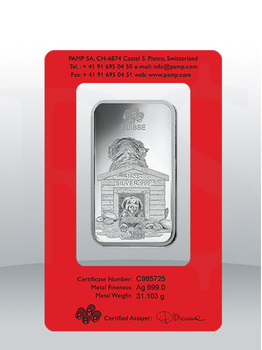 Contained on the red assay card is a serial number matching the one on each Silver Year of the Dog Bar, and guarantees the weight and purity of these PAMP Silver Bars.